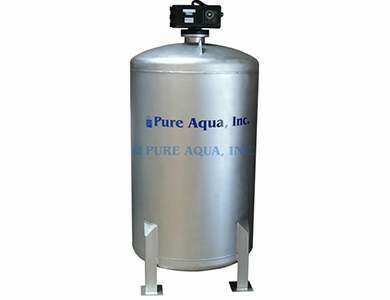 Pure Aqua's MF-450 Series Commercial Stainless Steel Tank Automatic Media Filters clarify water by removing unpleasant tastes and odors, unwanted color, iron, sediment, suspended particles, and turbidity, all of which are commonly found in surface water. They can be used in a variety of service conditions including, but not limited to: industrial, municipal, and institutional applications. 70F1435MM-SS 10.7 2.4 16.1 3.7 21.4 4.9 16.1 3.7 14X60 3.5 1"
70F1645MM-SS 13.9 3.2 20.9 4.8 27.8 6.3 20.9 4.8 16X60 5.5 1"
70F1855MM-SS 17.7 4 26.6 6 35.4 8 26.6 6 18X60 5.5 1 1/2"
28F1855MM-SS 17.7 4 26.6 6 35.4 8 26.6 6 18X60 5.5 1 1/2"
70F2175MM-SS 24.1 5.5 36.2 8.2 48.2 11 36.2 8.2 21X60 7.5 1 1/2"
28F2175MM-SS 24.1 5.5 36.2 8.2 48.2 11 36.2 8.2 21X60 7.5 1 1/2"
70F24100MM-SS 31.4 7.1 47.1 10.7 62.8 14.3 47.1 10.7 24X60 10 1 1/2"
28F24100MM-SS 31.4 7.1 47.1 10.7 62.8 14.3 47.1 10.7 24X60 10 1 1/2"
31F30150MM-SS 49.1 11.2 73.7 16.7 98.2 22.3 73.7 16.7 30X60 15 2"
31F36210MM-SS 70.7 16.1 106.1 24.1 141.4 32.1 106.1 24.1 36X60 21 2"
31F42280MM-SS 100 22.7 124 28.2 150 34.1 124 28.2 42X60 28 2"
70F1435AG-SS 8.5 1.9 10.7 2.4 17 3.8 17 3.8 14X60 3.5 1"
28F1435AG-SS 8.5 1.9 10.7 2.4 17 3.8 17 3.8 14X60 4.5 1 1/2"
70F1645AG-SS 11.2 2.5 13.9 3.2 22.4 5 22.4 5 16x60 5.5 1"
28F1645AG-SS 11.2 2.5 13.9 3.2 22.4 5 22.4 5 16X60 6.5 1 1/2"
70F1855AG-SS 14.1 3.2 17.7 4 28.2 6.4 28.2 6.4 18x60 5.5 1 1/2"
70F2175AG-SS 19.2 4.4 24.1 5.5 38.4 8.7 38.4 8.7 21x60 7.5 1 1/2"
70F24100AG-SS 25.1 5.7 31.4 7.1 50.2 11.4 50.2 11.4 24x60 10 1 1/2"
28F24100AG-SS 25.1 5.7 31.4 7.1 50.2 11.4 50.2 11.4 24X60 10 1 1/2"
31F30150AG-SS 39.5 8.9 49.1 11.2 79 1.8 79 1.8 30X60 15 2"
31F36210AG-SS 56.5 12.8 70.7 16.1 113 25.7 113 25.7 36X60 21 2"
31F42280AG-SS 77 17.5 100 22.7 149 33.9 149 33.9 42X60 28 2"
70F1435AC-SS 8.5 1.9 10.7 2.4 17 3.8 12.1 2.8 14X60 3.5 1"
28F1435AC-SS 8.5 1.9 10.7 2.4 17 3.8 12.1 2.8 14X60 4.5 1 1/2"
70F1645AC-SS 11.2 2.5 13.9 3.2 22.4 5 16 3.6 16X60 5.5 1"
28F1645AC-SS 11.2 2.5 13.9 3.2 22.4 5 16 3.6 16X60 6.5 1 1/2"
70F1855AC-SS 14.1 3.2 17.7 4 28.2 6.4 20.1 4.6 18X60 7.5 1 1/2"
70F2175AC-SS 19.2 4.4 24.1 5.5 38.4 8.7 27.4 6.2 21X60 9.5 1 1/2"
70F24100AC-SS 25.1 5.7 31.4 7.1 50.2 11.4 35.9 8.2 24X60 11.5 1 1/2"
28F24100AC-SS 25.1 5.7 31.4 7.1 50.2 11.4 35.9 8.2 24X60 12.5 1 1/2"
31F30150AC-SS 39.5 8.9 49.1 11.2 79 1.8 56.4 12.8 30X60 13.5 2"
31F36210AC-SS 56.5 12.8 70.7 16.1 113 25.7 80.7 18.3 36X60 14.5 2"
31F42280AC-SS 77 17.5 100 22.7 149 33.9 110 25 42X60 15.5 2"
70F1435BM-SS 8.5 1.9 10.7 2.4 17 3.8 17 3.8 14X60 3.5 1"
28F1435BM-SS 8.5 1.9 10.7 2.4 17 3.8 17 3.8 14X60 4.5 1 1/2"
70F1645BM-SS 11.2 2.5 13.9 3.2 22.4 5 22.4 5 16X60 5.5 1"
28F1645BM-SS 11.2 2.5 13.9 3.2 22.4 5 22.4 5 16X60 6.5 1 1/2"
70F1855BM-SS 14.1 3.2 17.7 4 28.2 6.4 28.2 6.4 18X60 5.5 1 1/2"
28F1855BM-SS 14.1 3.2 17.7 4 28.2 6.4 28.2 6.4 18X60 5.5 1 1/2"
70F2175BM-SS 19.2 4.4 24.1 5.5 38.4 8.7 38.4 8.7 21X60 7.5 1 1/2"
28F2175BM-SS 19.2 4.4 24.1 5.5 38.4 8.7 38.4 8.7 21X60 7.5 1 1/2"
70F24100BM-SS 25.1 5.7 31.4 7.1 50.2 11.4 50.2 11.4 24X60 10 1 1/2"
28F24100BM-SS 25.1 5.7 31.4 7.1 50.2 11.4 50.2 11.4 24X60 10 1 1/2"
31F30150BM-SS 39.5 8.9 49.1 11.2 79 1.8 79 1.8 30X60 15 2"
31F36210BM-SS 56.5 12.8 70.7 16.1 113 25.7 113 25.7 36X60 21 2"
31F42280BM-SS 77 17.5 100 22.7 149 33.9 149 33.9 42X60 28 2"
70F1435CF-SS 8.5 1.9 10.7 2.4 17 3.8 17 3.8 14X60 3.5 1"
28F1435CF-SS 8.5 1.9 10.7 2.4 17 3.8 17 3.8 14X60 4.5 1 1/2"
70F1645CF-SS 11.2 2.5 13.9 3.2 22.4 5 22.4 5 16X60 5.5 1"
28F1645CF-SS 11.2 2.5 13.9 3.2 22.4 5 22.4 5 16X60 6.5 1 1/2"
70F1855CF-SS 14.1 3.2 17.7 4 28.2 6.4 28.2 6.4 18X60 5.5 1 1/2"
28F1855CF-SS 14.1 3.2 17.7 4 28.2 6.4 28.2 6.4 18X60 5.5 1 1/2"
70F2175CF-SS 19.2 4.4 24.1 5.5 38.4 8.7 38.4 8.7 21X60 7.5 1 1/2"
28F2175CF-SS 19.2 4.4 24.1 5.5 38.4 8.7 38.4 8.7 21X60 7.5 1 1/2"
70F24100CF-SS 25.1 5.7 31.4 7.1 50.2 11.4 50.2 11.4 24X60 10 1 1/2"
28F24100CF-SS 25.1 5.7 31.4 7.1 50.2 11.4 50.2 11.4 24X60 10 1 1/2"
31F30150CF-SS 39.5 8.9 49.1 11.2 79 1.8 79 1.8 30X60 15 2"
31F36210CF-SS 56.5 12.8 70.7 16.1 113 25.7 113 25.7 36X60 21 2"
31F42280CF-SS 77 17.5 100 22.7 149 33.9 149 33.9 42X60 28 2"